Batteries, all you need to know about Narrowboat batteries. How your batteries work and understand how they work, plus how to get the most from them. When living aboard there are some real challenges of living off grid power. We have also lived aboard for 3 years now, cruising the system between May and October each year, so get to “live” the issues as well. The following is a “need to know” the practical issues rather than deep technical understanding of how batteries work. This article is giving you info, for everyone, from complete novices to those with more experience but who want to understand more. Before starting to unravel the boats electrical systems, it is important to categorise the different boat “power situations and demands”. A live aboard boat based in a marina that only “goes out” for the odd weekend and a couple of weeks once or twice a year. It is plugged into 230V with a decent charging system (more on chargers later), This type of boat doesn’t really have to worry about power at all. A live aboard continuous cruiser who spends one or two weeks sat in one location before moving on for a day or two . This type of boat is fine while moving as batteries are kept charged, but then has constant battles with keeping power up and running whilst sat enjoying time in one place. A live aboard on a permanent mooring without power. The hardest type of boat to power manage as it doesn’t need to travel with the benefit of charging batteries as it moves. It is these second two categories that this article will focus on. A boat setup according to accepted best practice should have two power systems. 12V DC low voltage for all “essential” systems. An essential system is one that in theory you do not want to do without and needs to be available at any time. Essential would be; Lighting, pumps for water and drainage, toilet systems and most importantly refrigeration. A 230V “mains” system that has standard 13A plugs and to the novice looks like it works the same as in a house. 230v is however is a “luxury” power for systems that you can do without and only use occasionally. This would be things like washing machines, irons, TVs (unless 12v) and vacuum cleaners . So why have these items at 230V instead of 12v? The reason is that most of these items are only made in a 230v versions without costing an arm and a leg. If you could buy 12V domestic appliances at affordable prices with the same range of choice as we are used to in say, Currys, then there would be no need for 230v products. However the market does not exist for 12v luxury appliances so for many of these items 230V is the only way to go. Where it really IS worth spending extra money on a 12V unit is the fridge or freezer as these are on 24 hours a day and if you are not plugged in and where is that power going to come from? An inverter, I hear the more informed of you cry! Yes, but see later for the big power cost…. In the first category, a boat in a marina, the boat will be plugged into mains power via a large lead, this means all 230v sockets on the boat are running straight from the mains power as they would be in a domestic house. Most boats these days will also have some form of a 12V charging system fitted. This will not only keep the batteries topped up it will also acts like a mains powered “battery” and runs all the boats 12V services directly from the mains – so in this scenario life is a doddle! Once the boat is disconnected from shore power however, as in the other categories of boat, then everything changes. The source of ALL power is provided by the humble 12V battery. The best way to uderstand a battery is like a large water tank, but instead of water its full of volts. (12 v).Think of a water pipe from the battery instead of a wire and a tap on the end of the pipe. If you open the tap, then the water (amps) flow down the pipe and out of the tap (opening the tap is, really a switch). The more the tap is opened, the more amps are flowing. As the amps flow, the volts in the battery drop until it’s empty. Charging the battery refills the battery with volts by passing current in amps back into the battery. This is done using some sort of charging system (the most well known method is, like a car, by running the engine). On the majority of boats 12V batteries are used. However some batteries on boats can be 24V. However we will stick with 12V batteries. These batteries come in two main types; starter battery and leisure batteries. The starter battery is used to start the engine only, it is use for nothing else. It is isolated on its own circuit from the leisure batteries that are used to provide 12V power for everything else in the boat. You will also hear leisure batteries referred to as “house” or sometimes “ships” batteries. You will notice the term “batteries” as more than one. This is because to provide the considerable amount of power required to keep a boats essential and luxury systems going it is normal to “bank” up batteries (to provide a bigger overall “tank” of power). It is possible to buy a very big battery but due to large sizes it is not usually practical to do so therefore it is usual to have, say 4 x 12V leisure batteries connected together to form one large battery or "tank". Batteries of course have a positive and negative terminals and it is just a case of connecting all of the positives together and all of the negatives together and taking a single supply from each. Beware if you connect them up wrongly you can create a 24V "tank" instead of a 12V one. So seek advice if not sure, so as not to damage your equipment. A single leisure battery are actually made up of 6 x 2V “cells” that together deliver 12V. Starter batteries and leisure batteries differ in that starter batteries are designed to deliver a very high current for a very short time, the time it takes to start the engine, and never drained (or “deep cycled”). Leisure batteries are designed to deliver a smaller current steadily over a long period of time and are likely to be regularly drained or deep cycled. Leisure batteries are divided into different technologies. The first of these and the most common, is the wet lead acid battery. This type are the oldest technology consisting of two lead plates in each cell dipped in sulphuric acid. Chemical changes occur between the metal and the acid when a voltage is passed through the positive to negative plate that cause it to store a voltage, a reverse reaction taking place when the battery is being used or drained. There is more to it than that but we need not go there. Lead acid batteries have several advantages. They can be “topped up”, when a battery starts to deplete its power some of the acid turns to water, this evaporates off over time resulting in loss of fluid. This can be replaced with de ionised water (distilled water). You just open the cap on each cell and pour some in! Lead acid leisure batteries will tolerate 200 – 300 “deep cycles”. However you must find this factor out when you buy your new battery so ask how many cycles does the battery have. The other type is the sealed Lead Acid battery, these when charged let off gases which are condensed and self “top back up”. However if sealed batteries become over charged due to a faulty or poor charging system, then the safety valve blows and electrolyte is lost that cant then be topped up. Instead of the term “maintenance free” it should be “cant be maintained”. Gel batteries. These are batteries where the acid electrolyte is contained in a thick gel paste. They are permanently sealed and were originally designed for applications where the battery may be turned upside down such as ocean going boats, airplanes and the like. They can be installed sideways which can sometimes be an advantage if space is a problem. It is VERY important to understand that two identically rated batteries, one gel and one lead acid will have the same amount of stored power. Gel batteries do not give you more power. They do however give more deep cycles – a 1000 is about par for the course AND you can leave them is a discharged state then re charge them and they will happily come back up again. A similar battery type is the AGM (Absorbed Glass Mat). These use glass fibre matting between plates which makes for a bigger plate contact area and thus a battery that can deliver starter type high current and deep cycle. If you can afford AGM batteries they are the best way to go for a long reliable life. However they are not tolerant of being over charged so you need to be really sure your charging systems are in good order. Most boats have a bank of 12V lead acid or Gel/AGM batteries. Individual batteries have their capacity rated in AMP Hours. That is to say how many amps they can deliver over one hour. So a 110ah battery can deliver 110 amps over one hour if you are drawing 1 amp. This means if you are drawing say 10 amps with the TV, lighting etc during an evening then every 6 minutes you will draw 1 amp hour. However the bad news is that a battery’s usable range is not the full range of the batteries voltage. Going back to the water tank analogy – the pipe running to the tap is a long way up from the bottom! A fully charged battery will sit at around 12.6 volts assuming you don’t draw anything from it. The usable voltage runs down to about 11.5 volts. Beyond that level if you continue to drop the voltage the battery life will suffer so it’s not advisable to lower the voltage beyond this point. Beyond this 11.5V level the battery will quickly drop down to 10.4 volts which is a truly dead battery – referred to as “voltage end point”. The most widely known form of charging is just like a car, running the engine which turns an alternator that charges the batteries. Batteries need a voltage of 14.4 volts to accept a charge. Alternators use a very simple system called a taper charge. The alternator outputs a voltage of 14.4 volts and the battery bank being at a much lower voltage accepts this and starts reversing the chemical process of discharge and “takes on a charge” as the battery voltage rises, its resistance to the alternator increases and so the alternator current reduces. It’s a bit like an old fashioned balance type weighing scale, eventually the resistance from the charged battery becomes great enough so that the alternator output drops to close to zero. However, at that point the battery is generally only at 80% of its maximum charge. This is not a problem for a starter battery, that is plenty to start the engine, BUT if your leisure batteries are only at 80% charge that is another huge drop in your usable battery power. It’s just the simple balanced way that alternators work. Alternators also range in their output, older boats tend to have alternators of around 50 amps output where as newer engines are often fitted with alternators as high as 175 amps.There is a way round this however, see Smart Alternator Charging below. Another important point to be aware of here is, remember we have a starter battery and a bank of leisure batteries? These are two separate battery banks so that if you drain the domestic batteries, you still have the fully charged starter battery to crank over the engine. How is this possible? Older boats typically only have one alternator so some kind of “split” charging is needed. This means that while the engine is running the charge goes to both the starter and domestic batteries, but once the engine is shut down, the batteries are “separated” so the starter does not get discharged by domestic services. Here are some ways of doing this. A split charge relay can be used. This is a simple electro mechanical “switch” that closes when the starter motor is energised and ensures charge flows to both sets of batteries, then opens when the engine is shut down so both battery banks are isolated. Alternatively a split charge diode can be used. This is an all electronic device that performs the same task BUT diodes introduce a voltage drop of a little over 0.5 volts – this hugely reduces the charge. Bulk charge phase – the charger puts in its maximum current at a voltage of 14.4 bringing the battery up to its 80%. Absorption charge phase – The voltage is held at 14.4 but the current is gradually reduced creating a trickle charge that takes the battery up close to its 100%. Float charge phase – Voltage is dropped to just below 13.5 so the so the batteries don’t start to gas and current is reduced to very close to 0 amps, but if a consumer demands power from the battery the current is raised to support this. The float charge stage is very useful as it means while plugged in you simply leave the charger on all the time, it will keep the batteries in tip top condition AND runs all of your 12V services at the same time acting like a mains powered battery in effect. Chargers range in power output rather as alternators do typically from 10 amps to 120 amps depending on your budget and the speed with which you want to charge the batteries. In reality somewhere around a 40 amp charger is more than sufficient for a typical 4 x 110ah battery bank. In fact many marina berths have a limited mains power supply and large chargers can cause the trip to go off on the “post” that you connect to. Some charger manufacturers provide a way of turning down the input to cater for this. Battery monitoring is very important if you are living with no shore power, it’s the only way you can know what’s going on. So what can you monitor and what are the options? Let’s just review battery voltages: 13.5 – 14.4 volts is a battery under charge. Once the charge stops the battery will quickly drop to 12.6 volts which is where it will sit until you start to draw power. You then have from 12.6 down to 11.5 volts as you use the battery, then it needs charging again to avoid damage. The simplest “tool” is a volt meter. An analogue gauge measuring between 0 and 14 volts usually. Many boats have these and whilst they give you a guide, because we are only interested in that small window between 11.5 and 12.6 its actually quite difficult to “see” where your batteries are in that small band on an analogue dial. A better and still cheap option is a thing called a battery condition meter. 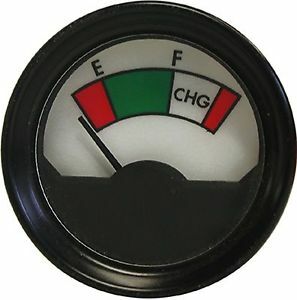 These can be a similar analogue dial to the volt meter but instead of being marked up in volts the scale has a red section, an amber section a green section and a white section at the far right hand end. The gauge actually measures from 11 to 14.4 volts but the coloured scale usefully shows you where you are. If the needle is in the green then you are ok, if it drops into amber you need to start thinking about charging and if it drops into red then you need to charge. When under charge the needle goes all the way over to the right into the white “charging” section so it also gives you a good indication that your charging is correct. (see volt meter and battery condition meter pics) These are also available quite cheaply from car accessory places in a rectangular meter about 1 inch wide and about 3 inches tall with 6 LEDs on that you can permanently fit on the boat. However the ultimate tool to have is a full battery management panel. These are quite expensive and more complicated to fit BUT give you the full picture. 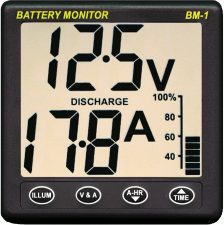 The battery voltage is there, plus a view of the amps you are drawing (shown as a negative figure) or charging (shown as a positive figure). This allows you to see how much current you are drawing “at a glance” and “trim” your power down if need be by turning off things that don’t need to be on. The third very useful bit of info these devices give is the number of amp hours used. This tells you exactly how much you have used since you last charged. Say, for example, you moor up and spend the evening with some lights on and watching the television. At the end of the evening your meter shows you that you have used 65 amp hours. When you run the engine the next day it will count those amp hours back down to zero by monitoring the amps coming off the alternator. So using this you know for sure how long you need to run the engine for. If you make use of solar charging, this too can be wired through the system so all solar charge will count back the amp hours too. In fact when these are installed it is essential that all services and all forms of charging are wired through the measuring bit of the monitor (called a shunt). The various gauges described above are great for monitoring batteries that are known to be good and in use but what about when you start to have problems? What problems typically occur? A common problem is that batteries that have been under charge for hours do not “appear” to hold the charge for very long. This is usually an indication there is a problem. A common failure of a battery is for one of the 2v cells to “die” leaving you with a 10V battery – this is because metallic substances from the plates drop to the bottom of the cell during discharge, eventually building up to a level where the cell shorts out. But of course your batteries are in a bank of maybe 4 or more so it’s not immediately obvious what is going on but what happens is the good batteries keep draining into the one with the dead cell as soon as the charging stops. The only way to check for this is to disconnect each battery so they are no longer in a bank and run a volt meter over each one in turn until you find the 10V one. In the short term you can just leave this battery out and reconnect the remaining batteries. Strictly speaking you should then replace the ENTIRE bank of batteries as replacing just one is not a good practice as it will have different charge characteristics to the others. However if you know the remaining batteries are good then you can get away with it as long as it’s of the same type and size. One thing to watch out for is that many lead acid batteries have a little window on top of the battery that shows whether it’s fully charged by turning green. Do not rely on this as it’s only looking at ONE of the 2V cells, another cell in the battery might be dead, or need topping up for example. Other issues can arise with the electrolyte (the acid) not being strong enough any more due to water build up and sulphation of the plates (a build up of material that stops the electrolyte reacting with the plate properly). With lead acid batteries the only way to properly identify if the battery is holding a charge is with a hydrometer. This is a big syringe type device with a float inside it which measures the specific gravity of the acid. You just draw some acid – very carefully I must add – into the hydrometer and see where the float is. This is a sure fire way of telling if a battery is fully charged. A fully charged battery should measure 1.265 on the hydrometer. You then need to test each cell in turn, taking care not to spill any acid. Cells that have low acid will also output a lower voltage and should be topped up with de-ionised water which can be bought in car accessory shops very cheaply. Lead acid batteries should have their levels checked and be topped up I would say every 3 months. Another test is to monitor the battery voltage once the batteries have been charged with everything switched off and see if it rapidly drops below 12.6. If it does then chances are the bank needs replacing. Another classic problem I see often is that without battery monitoring tools a boat owner will run their engine for a couple of hours each day but find that the level of charge seems to get less each day. This is because on day one the batteries get charged to 80% then on day two 80% of 80% and so on, so the actual capacity dwindles. Hence you can see the benefit of the proper management panel. Have you done a Power Audit on your boat?? You really should do a power audit on you boat, this will allow you to see exactly how much energy you use on your boat. What you have to do is make a list of ALL the electrical items on your boat and their current consumption. If item only has a wattage rating you will need to calculate the current. So for 12 and 24 volt systems divide the displayed item wattage by 12 or 24 volts respectively. For anything running from an inverter, then you need to divide by 10 for 12 volt or 20 for 24 volt system. This builds an approximate 80% inverter efficiency into the calculation. You then need to decide the time you will be using each item for, to establish the in between battery charging sessions. It is suggested that you start with a 24-hour period. Choose the "worst" time of year for your electrical demand, ie winter. A continuously cruising boat this may well be in January, a holiday boat may use October or March which are at the end or start of the average cruising seasons. We now multiply the amps by the hours used and total all the results. Waterways World have a great calculator to due this so if you go here you will be able to do it online. We do suggest you read the notes on the calculator first (see the link on the page) as it will give information on what block does what.